We recently had the chance to review a cute hooded towel from SwaddleDesigns. "SwaddleDesigns is best known for our Ultimate Receiving Blanket® which is much larger than typical receiving blankets and square in shape - and it is the only blanket with swaddling instructions sewn to its edge (patent pending). Parents tell us how much they love our blankets and find the swaddling instructions at their fingertips very helpful. We offer two types of fabric for swaddling: Flannel and Marquisette. · Flannel is the #1 Choice in US hospitals for swaddling babies, because it is thin, lightweight, breathable, but not too thick. Cotton flannel is appropriate for moderate to cooler environmental temperatures. · We also offer a very lightweight open weave cotton Marquisette Swaddling Blanket® which is appropriate for warmer climates or summer swaddling. Cotton marquisette is the highest quality open weave fabric due to its high quality threads and thread count. "SwaddleDesigns Ultimate Receiving Blanket is large, square, lightweight and breathable (42 x 42 inches). It is made from super soft, premium, preshrunk cotton flannel. Cotton Flannel is the #1 Choice in US hospitals for swaddling. • Large, square, multi-use blanket perfect for swaddling and much more! • Made in the USA with superior quality"
What we thought: The hooded towel we reviewed was wonderful! It was really well-made and so soft to the touch. It was very absorbent and got the job done while adding some cuteness to our bathtime routine. I love the mod circle designs! D really loved the towel too. It was actually hard to get him out of the towel and into his jammies and even afterwards he carried the towel around until bedtime:) The products at SwaddleDesigns are cute and functional and I would recommend them to anyone looking to add a little luxury comfort to their baby or small child's world:) ABCD Diaries gives SwaddleDesigns an A+! Buy It: Find these wonderful blankets, towels and more at SwaddleDesigns. Win It: One ABCD Diaries reader will win the Ultimate Receiving Blanket in their choice of color and pattern!! To enter, sign up to follow our blog via GFC and visit SwaddleDesigns...come back and comment on your favorite product. Disclosure: ABCD Diaries was given a hooded towel for review purposes only. We were in no other way compensated. The opinions expressed in this post are ours and ours alone. 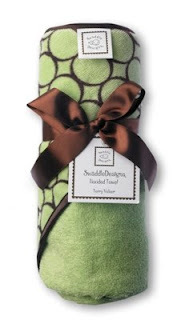 I follow via GFC, and I love the SwaddleDesigns - Hooded Towel - Lime with Brown Mod Circles. I'm due in July with my second child, and this time around I want to get some "real" swaddling blankets (no teeny ones that you get from everyone). My eye is on the Ultimate Receiving Blanket - Lime with Brown Mod Circles. I love the colors! I love the cashemere Pastel with Mocha blanket. I follow you via GFC. My favorite product is the SwaddleDesigns - Organic Cotton Flannel zzZipMe Sack - Pastel Pink Dots & Hearts with Pastel Pink Trim (6-12 months)! I follow your blog via GFC! I love the SwaddleDesigns - Fitted Flannel Crib Sheet in Pastel Pink with Brown Mod Circles! I like the SwaddleDesigns - Ultimate Receiving Blanket - Pastel Blue with Brown Mod Circles but I also like the Adult Swaddle Wraps! I'm following your blog via GFC and I visited Swaddle Designs and my favorite product is the Marquisette Swaddle Blanket. It's so nice and big and good for warm climates too. Thanks! I like the SwaddleDesigns - Organic Fitted Flannel Crib Sheet - Pastel Blue Mod Circles on Ivory & follow via google. I like the jewel tone puff circle adult swaddle wrap looks super comfy.. I entered your Pyur diaper balm giveaway! entered Dots and Dahlias giveaway! entered Cook in the Kitchen giveaway! I follow you on GFC(Linda G) and I like the zzZip Me Sack Very Berry with Dark Very Berry Satin. Help a Shelter Pet this V-day through Facebook!